The classic chairside table modernized for today’s high-tech lifestyles. 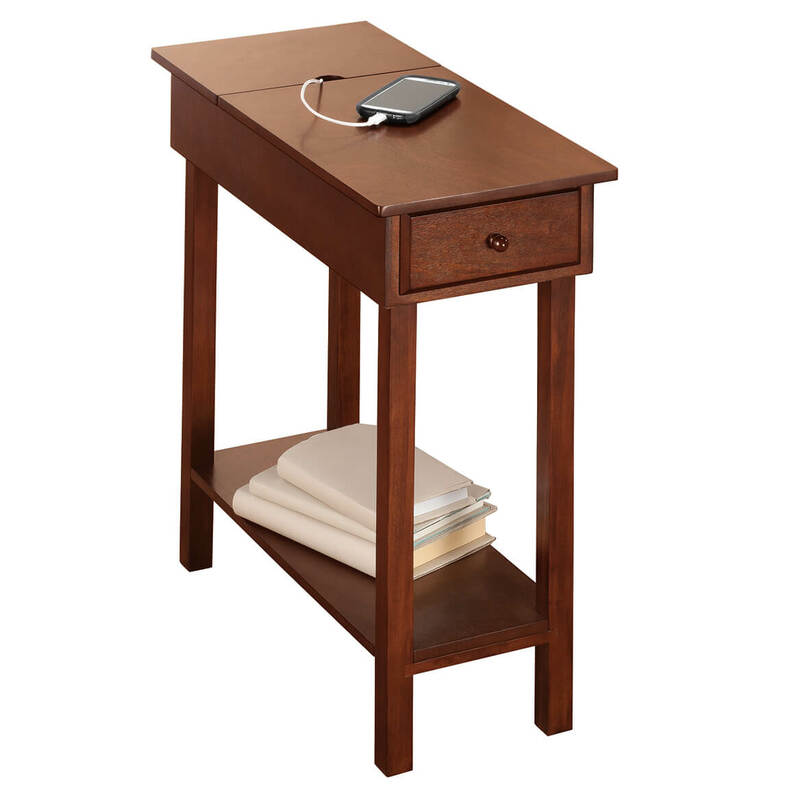 Exclusively from OakRidge™, this slim occasional table features a power strip with three 3-prong outlets and two USB ports! So you can plug in a lamp, laptop, and more while charging your phone and other smart devices — all right by your side for easy access while relaxing in your living room or bedroom. Attractive MDF table features a top opening for keeping cords out of the way and a bottom shelf for extra storage, plus a convenient drawer. 24” long x 11” wide x 24” high design fits in small spaces. Personalized child’s natural rocker is designed for the littlest rockers. This personalized child’s rocking chair is an heirloom quality keepsake that doubles as the sweetest seat in the house! Crafted of sturdy, solid hardwood; natural finish. Holds up to 70 lbs. Specify name; limit 1 line, 12 letters/spaces. Specify personalization color; blue, pink, red or black (blue is shown to left). 22 1/2″ high overall; seat is 14 1/2″ wide x 11 1/2″ deep and 10″ from floor. Easy assembly; instructions and hardware included. Designed for the littlest rockers, this heirloom quality child’s rocking chair is the sweetest seat in the house! 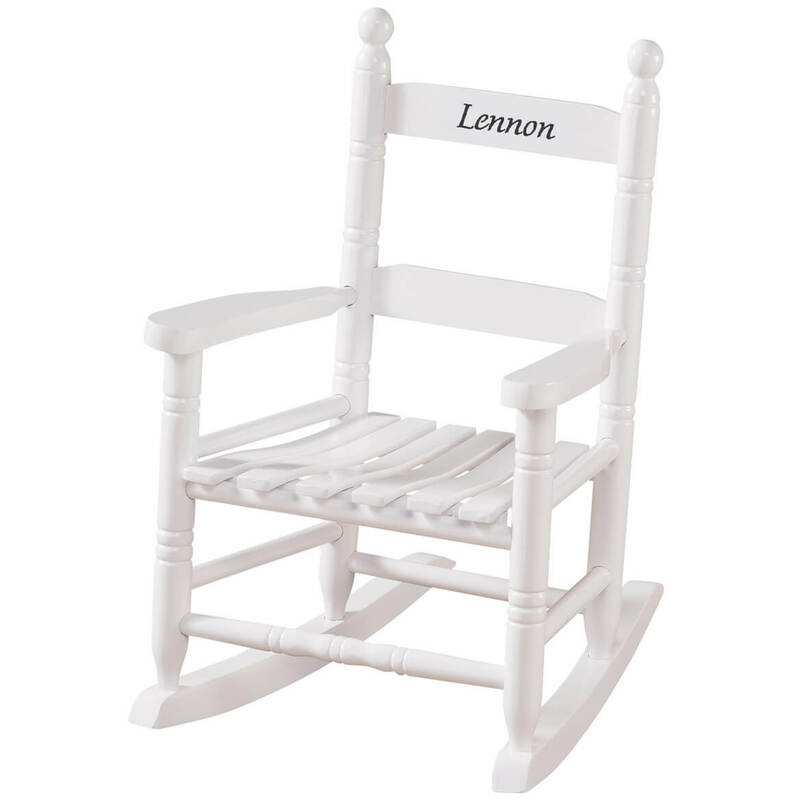 Personalized child’s white rocker is crafted of sturdy, solid hardwood. Holds up to 70 lbs. Specify name; limit 1 line, 12 letters/spaces. Specify personalization color; blue, pink, red or black (pink is shown to left). 22 1/2″H overall; seat is approx. 9″ from floor and measures 14 1/2″ wide x 11 1/2″ deep. 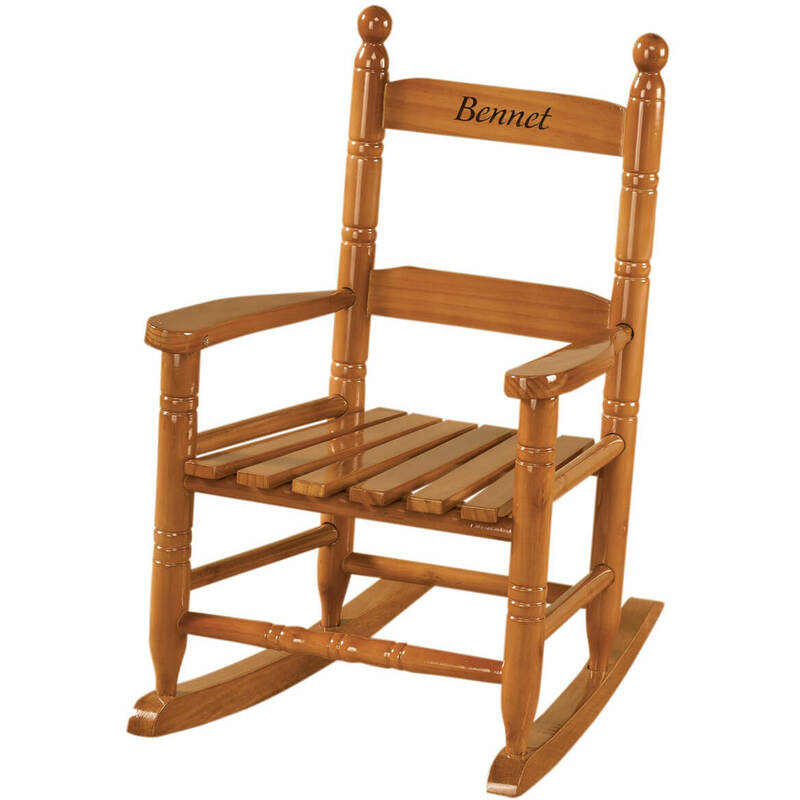 Easy assembly; instructions and hardware included with personalized child’s rocking chair. 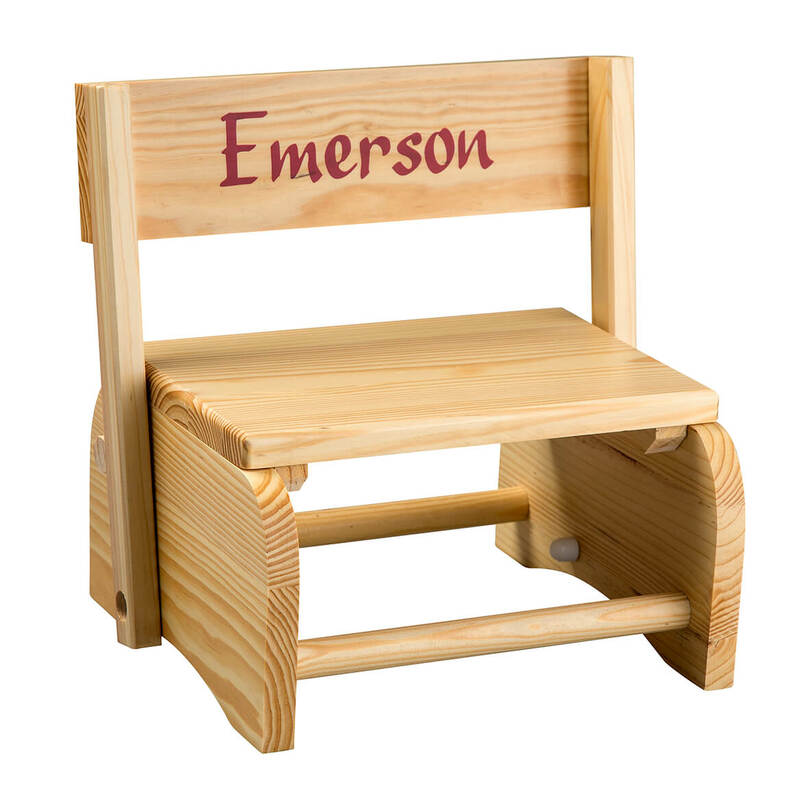 Our wooden personalized childrens chair provides a little chair that’s just right! Our personalized kids chairs also make sinks and toy shelves reachable for toddlers. Natural finish chair of 3/4″ thick “knotty pine” wood is smoothly sanded, joined with rounded screws. Base of the stool is 9 3/4″ x 10 3/4″; seat is 6″ from the floor, 12″ high with back up. We’ll hand paint your child’s name in red, block letters. Specify a name for each personalized chairs for kids. Limit one line, 20 letters or spaces. Maneuver anywhere you need a table for meals, activities and more with this rolling tray table. 3″H steel H-base with swivel casters easily rolls under beds, sofas and recliners. Smooth, stable tray table surface locks in place for flat or angled use over furniture. 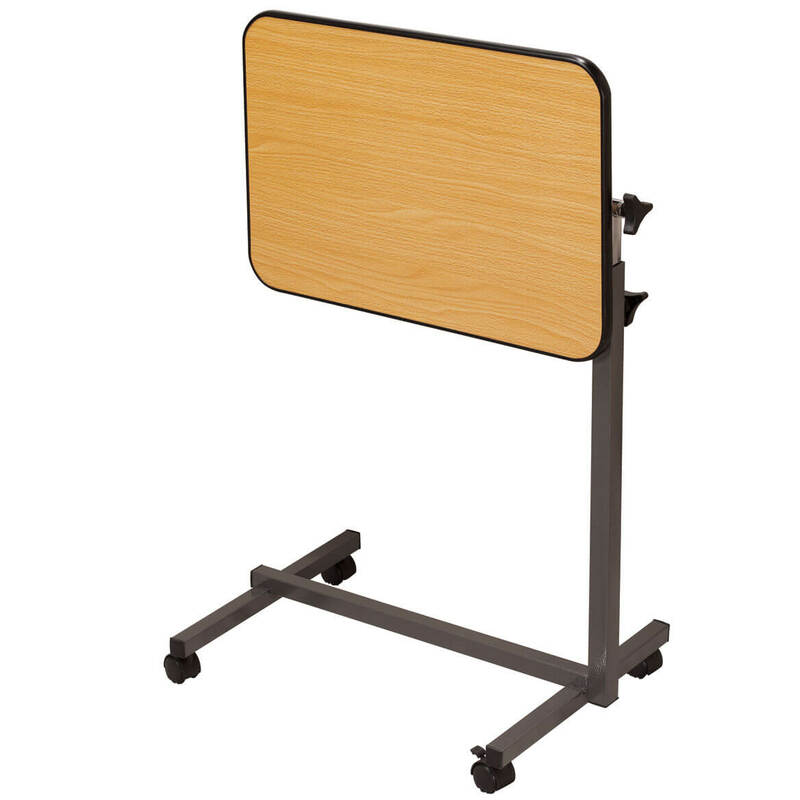 Tabletop measures 23 1/2″ long x 16″ wide; height adjusts 27 1/2″ – 47″. Wood grain laminate top. Easy assembly required. No express shipping. Versatile, space-saving two-tier swivel table by OakRidge™ swivels to reveal or conceal depending on your needs! Use it slim and stacked as an end table in tight spaces, or swivel it open to reveal two surfaces perfect for eating, writing or extra storage. Handy drawer provides discreet storage and won’t fall out no matter how far you pull it. Rich dark wood finish complements any décor. Assembly required; hardware included. Tiered table measures 23 3/4″ long x 11″ wide x 23 3/4″ high overall. Top surface is 23 3/4″ long x 11″ wide, bottom is 21″ long x 11″ wide, with 4 3/4″ in between. Drawer is 4 1/4″ wide x 1 3/4″ deep. Accent table made with medium-density fiberboard. Imported. Add $5 to shipping charge. No express shipping. 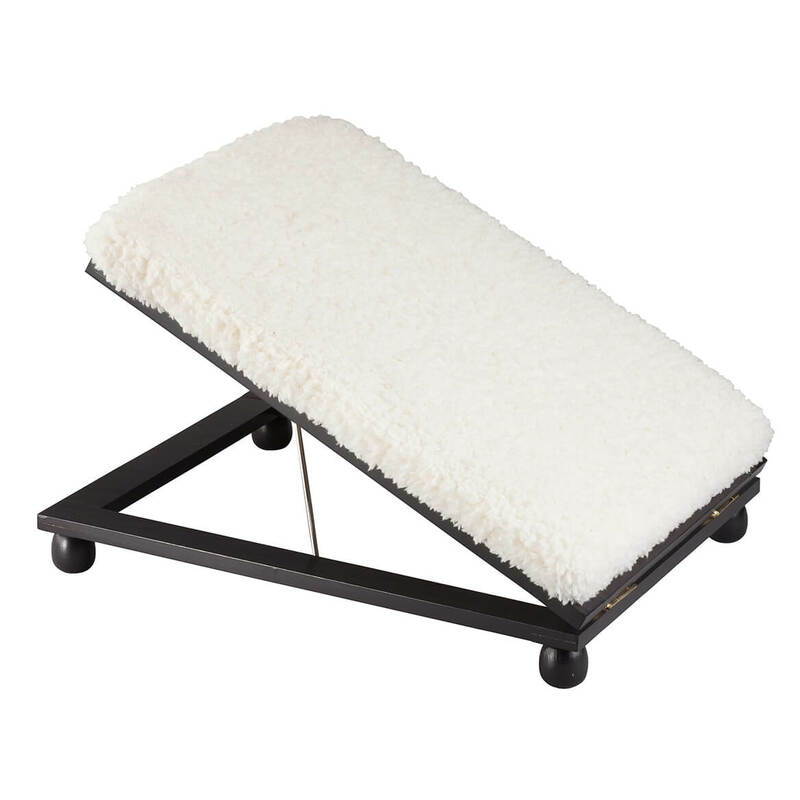 Elevate your legs on this luxurious sherpa wooden footrest, and elevate your comfort on its cozy sherpa padding. Designed exclusively by OakRidge™, the folding footstool features solid wood frame with warm mahogany finish. Smooth-rolling wheels make it easy to move and reposition … or fold it down and roll it under sofa, chair or end table for space-saving storage. Natural polyester sherpa cover adds style and texture to any décor. 15″ long x 12 1/2″ wide x 13″ high; folds down to 6″ high. 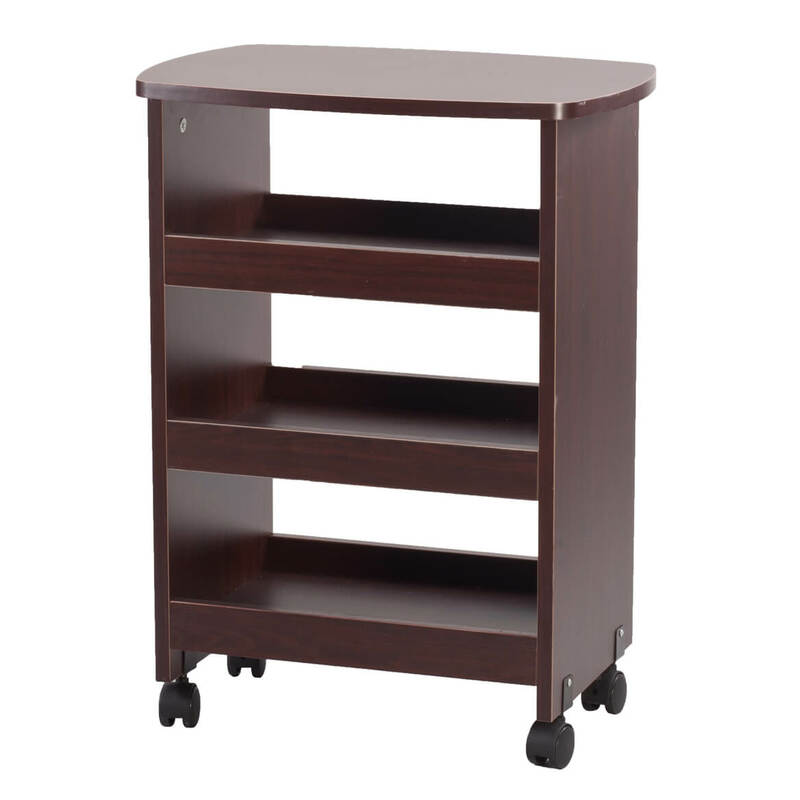 When your storage needs shift, this three-drawer multipurpose rolling cart by OakRidge™ rolls with the changes. Handy wheeled cart easily moves from room to room thanks to its 4 smooth-rolling casters, 2 of which lock in place. 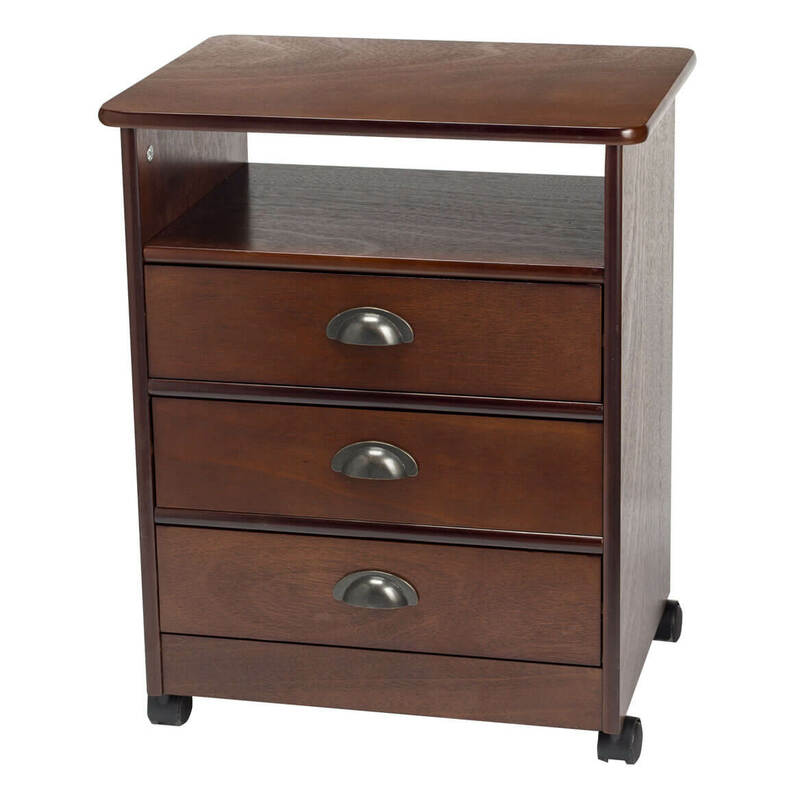 Solid wood utility cart in a beautiful dark finish features a spacious tabletop, open storage shelf, and 3 drawers with stylish metal handles — perfect for living room, kitchen, bedroom, home office or craft room. Assembly required; hardware included. Overall measures 19 1/4″ long x 14 1/2″ wide x 24″ high. Each drawer is 16 1/4″ long x 12 1/4″ wide x 3 3/4″ high with 4 1/4″ of space between. Medium-density fiberboard. Imported. Add $10 to shipping charge. No express shipping. 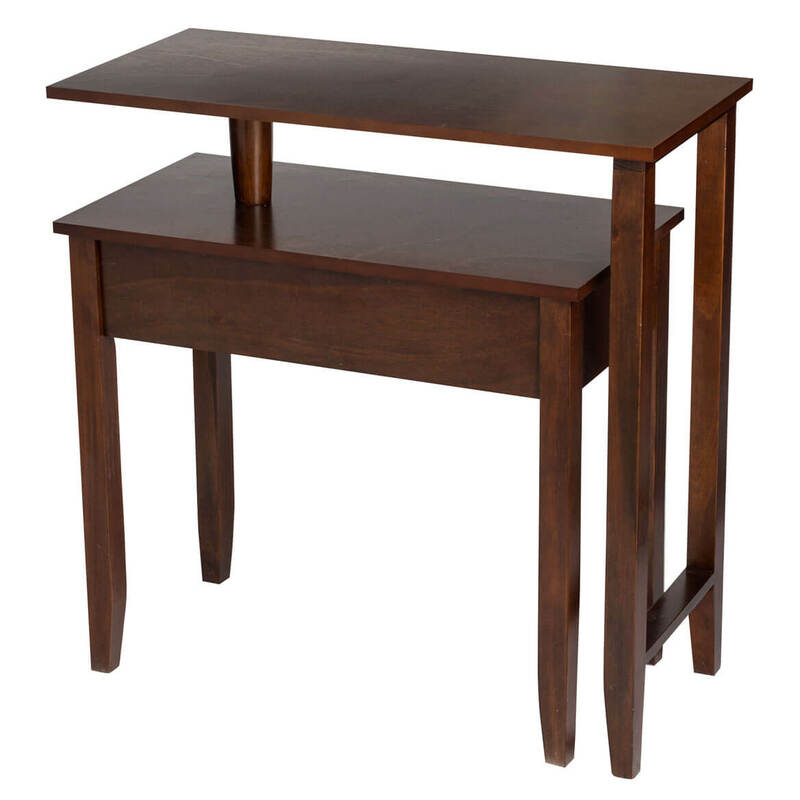 Enjoy a close relationship with our Newport magazine table with drawer by OakRidge™! Portable side table pulls in closer than the others, with a C-shape and feet that slide under your sofa or recliner to keep items within easy reach. You can even pull it in over your lap for eating, crafting or computer use. Drawer is perfect for eyeglasses, remotes and more, and the 3”D magazine rack holds your favorite catalogs, newspapers and other reading materials. Rich mahogany finish beautifully complements any décor. Easy assembly required. End table measures 16” wide x 23” deep x 28” high. MDF. 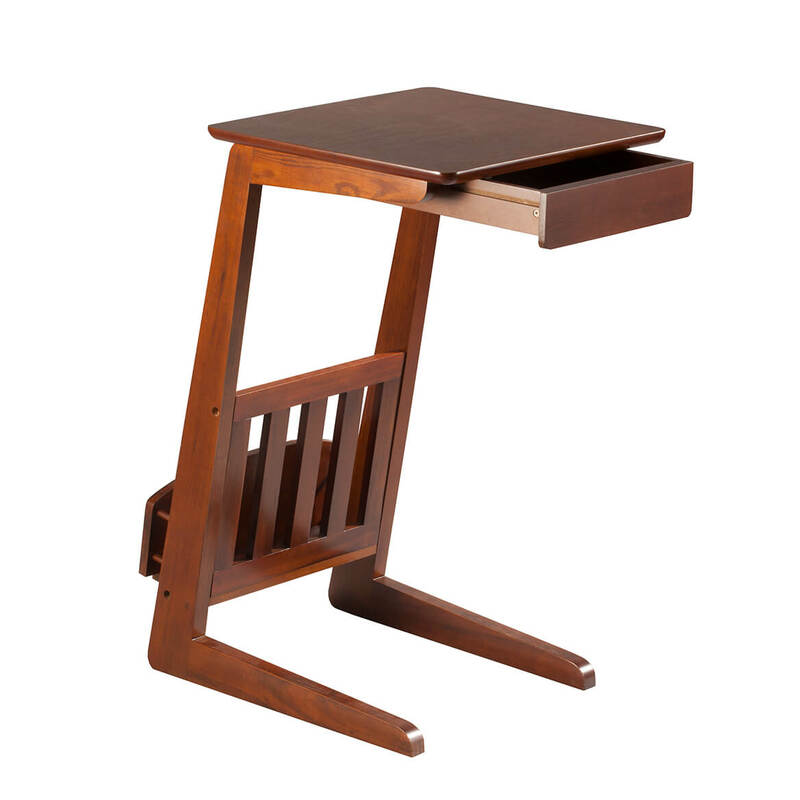 Exclusively by OakRidge™ Accents, easy-to-move rolling table holds anything you need. Easy-glide wheels lock in place for added stability. Sturdy, solid top and three recessed shelves in classic mahogany finish. Assembly required; hardware and instructions included. Rolling cart is 18 3/8″ L x 13 3/8″ W x 24 1/4″ H overall. No express shipping.